More and more, I look for ways to make my own products because at the end of the day, I’ll know exactly what’s in them. 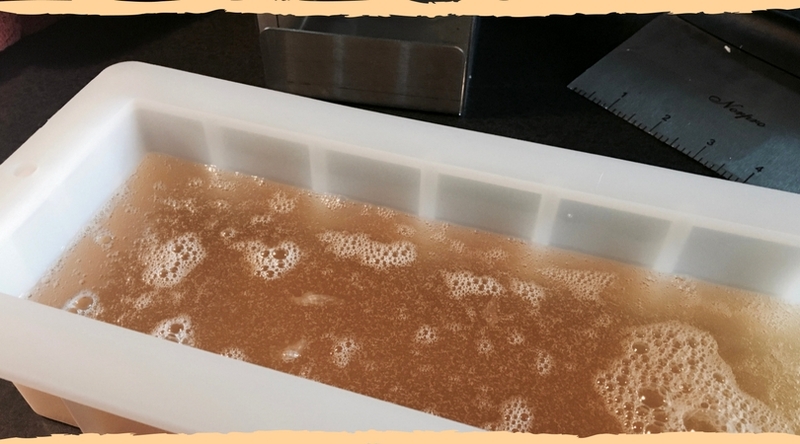 Over the weekend, I decided to make my own soap. It was a relatively easy process and the final results were awesome! So, I wanted to share the steps with you! Melt and Pour Soap Base and Accessories Ok, so maybe I cheated a little, but I used Stephenson’s Melt & Pour soap base. There are tons of soap bases you can choose from, so pick the one that’s right for you. 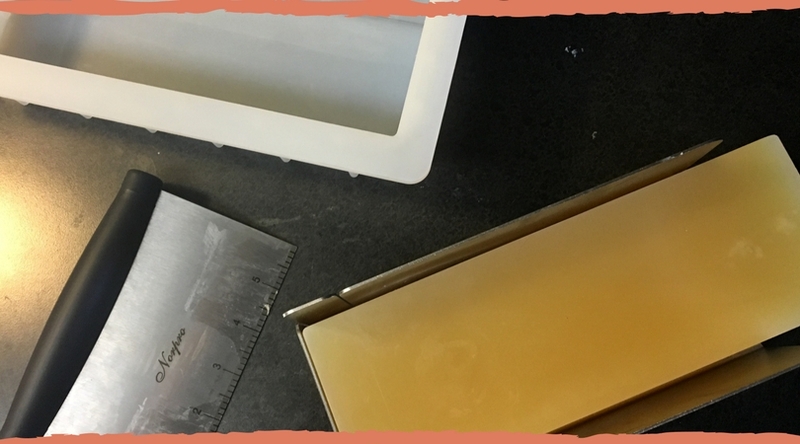 You’ll also need a a soap mold, a cutter, and a miter box to make cutting the soap easier. I wanted my soap to be ultra-moisturizing, so I added one small ice cream scoop full of shea butter, 6 drops of Vitamin E oil, and 2 TBSP of sweet almond oil. For the scent, I went Grapefruit essential oil. What are benefits of Sweet Almond Oil? Rich in vitamin e, fatty acids, protein, and potassium, sweet almond oil is perfect for keeping skin soft, softening fine lines and wrinkles, relieving dry skin, psoriasis, and eczema, and reducing muscle aches. It’s also great for controlling hair loss, so definitely try using it as a hair serum! What are the benefits of Vitamin E oil? Vitamin E protects against toxins like air pollution. It improves moisture and elasticity in the skin, which helps maintain healthy, younger looking skin. Vitamin E also naturally slows aging and repairs damaged skin. Shea butter is skin smoothing, anti-inflammatory, and nourishing. It can be used as a base for many of your beauty products, like hair conditioner, lotion, and deodorant. Shea butter works with your body’s natural collagen. What are the benefits of Grapefruit Essential oil? Grapefruit essential oils is a natural antibacterial, it improves circulation, and the scent not only uplifting, but it also reduces “brain fog”. It’s also a skin brightener and helps fight acne. You can use whichever essential oils you’d like. 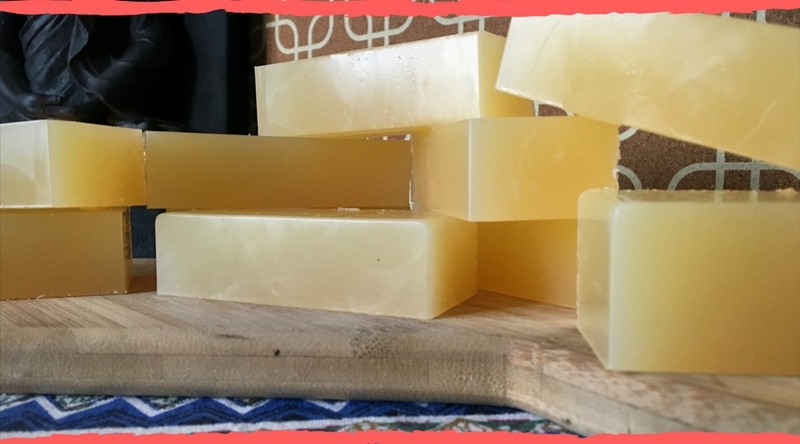 Maybe you want a lemon lavendar soap or patchouli… the possibilities are endless. Either way, you don’t have to break the bank for you oils. Twig and Petal offers pure essential oils. 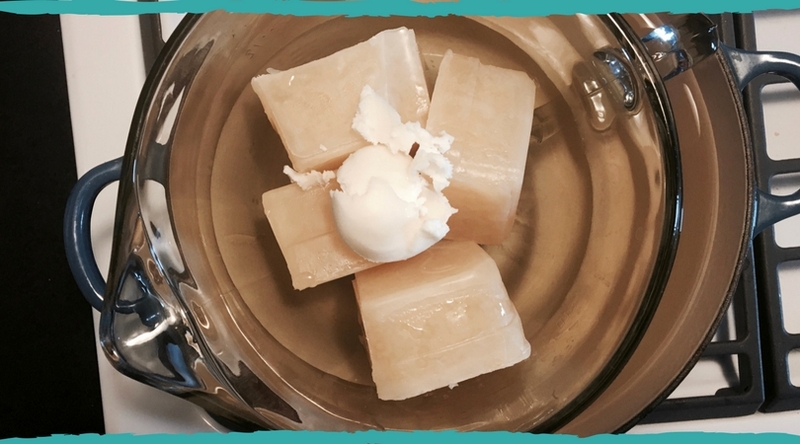 You’ll want to cut your soap so that it will fit in a double boiler. It will also melt easier if it’s broken up. 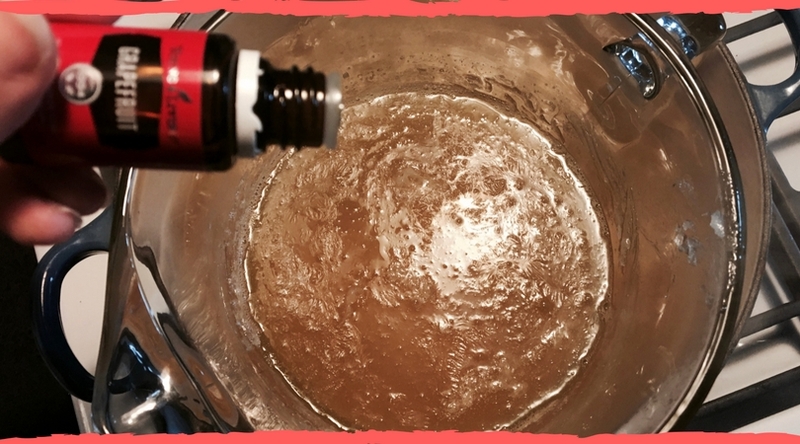 I used a large glass measuring bowl with a spout to create my double boiler. Place in a large pot of water and bring to a boil. 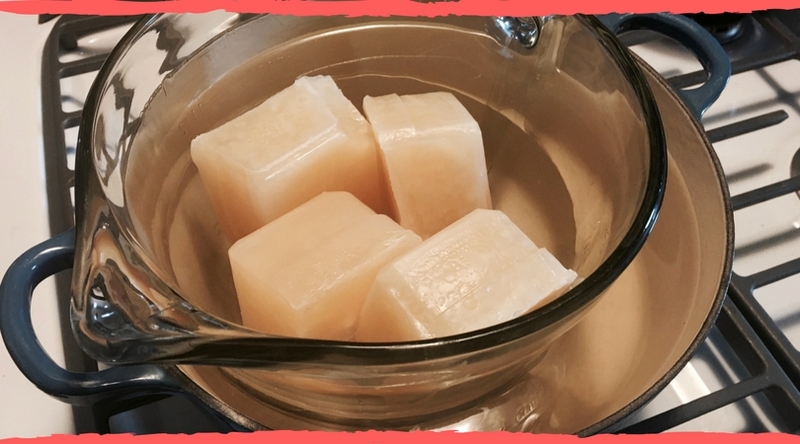 Using a double boiler method will ensure that the soap does not burn. As the soap starts to melt down, add your liquids (vitamin E and almond oil) and add your scoop of shea butter. It took about 45 minutes for the soap to melt down. Afterwards, I added 40 drops of Grapefruit oil. Stir it up with the end of knife, then turn the flame off. Carefully, but quickly, pour the soap into the mold. Let it cool– about another 45 minutes. 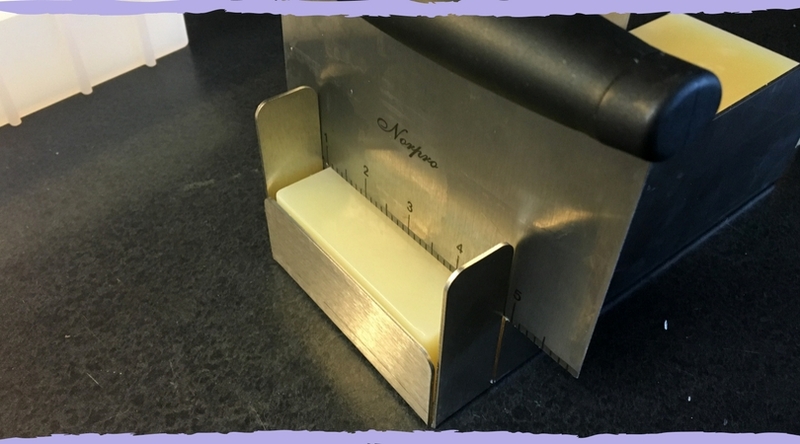 Carefully push cooled soap out of the mold and place it in the miter box. I suggest using the miter box so that all of your cuts are even. 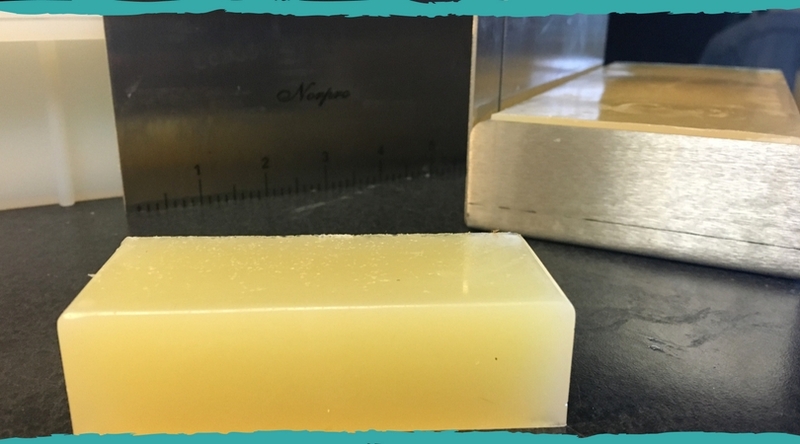 Gently push the cutter down into the soap… and… VOILA! You have made soap! I already used it in my shower and I LOVED it. It smells amazing and it made my skin feel really soft. I think this is a DIY win! This made 10 bars, so I won’t be needing soap for a while. But, I can’t wait to experiment with other bases and adding things like coconut milk, honey, and coffee. 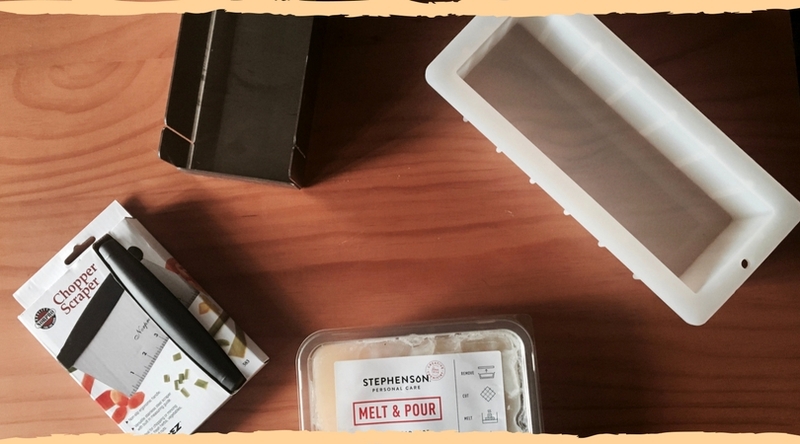 Another great resource for soap making, candle making, essential oils, etc. is Bulk Apothecary. You can find all of the ingredients I used there! Prices are below market value and you can buy in bulk! We recently bought a book on how to make our own soap. It really doesn’t look that hard, just have to decide what scents we want! I have always wanted to try making my own soap. It looks so fun. I would love to add coffee! 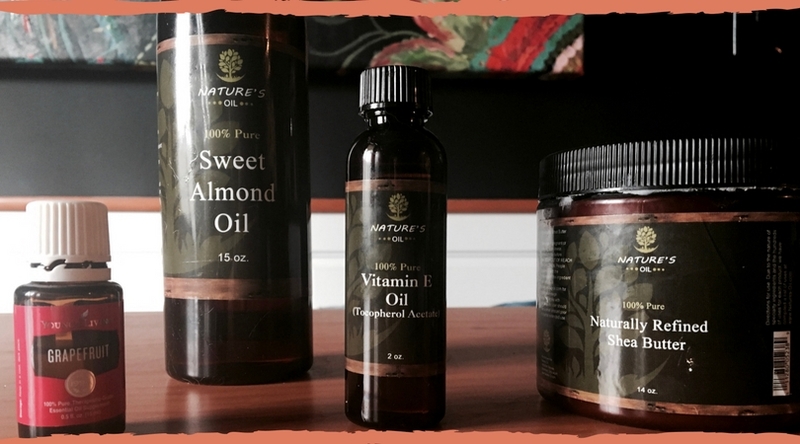 Almond oil and vitamin e are so good for your skin! I’ve been wanting to try this. Thank you for sharing! I love DIY home and bath products. 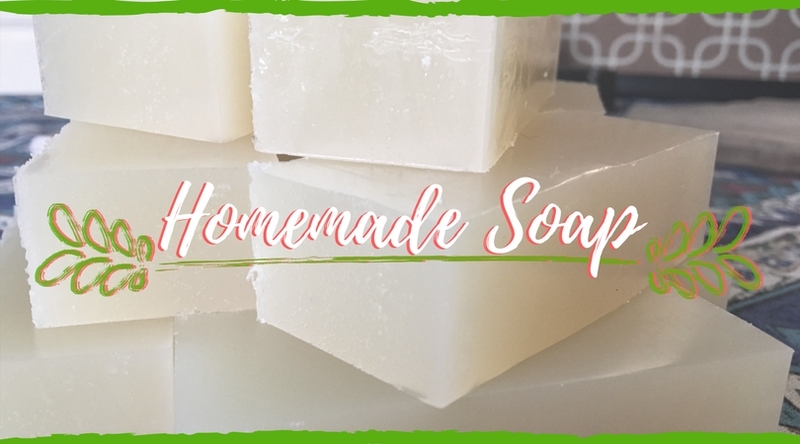 I have to admit I have never tried making my own soap before, but it sounds like such a great idea, I love that you add your own scents. Might have to try this for christmas. They’d make great Christmas gifts! Ooo I bet this smells amazing. I need to try this out soon. I’ve never tried to make my own soap before. It does smell amazing. It’s a great pick me up in the morning for sure. I have never made my own soap before, but it’s something I’ve always wanted to try. I think these can make great gifts with the perfect scents and shaped molds! They would totally make great gifts! I know I love when people make me things. And there are so many pretty molds to choose from! I’ve never made my own soap before, but I’d defiantly try this! With Christmas coming (Sorry for the C word! ), I’d love to make some for my SIL. I think i’d use those silicone soap molds though… they look user friendly. I’m thinking about Christmas too! Haha Yes, the silicon molds are super easy to use. I am so impressed with DIY projects. Especially ones that I have not yet tried. This is great and you know exactly what goes inside. Yes! I love knowing what’s in there. Let me know if you try it out. I would love to try making my own soaps. I have been using essential oils for years. They have so many great benefits. I love grapefruit essential oil. It’s a great way to use all those oils for sure! Yay! Let me know how yours turn out! I didn’t know it was so easy to make homemade soap. I’ve been wanting to try this DYI for a while now and now I feel like I can finally try it out. Yes!! Try it and let me know how you liked it. It was way easier than I thought it was going to be too! You’re very welcome! I think they would make great gifts too! No artificial chemicals are super important! I recently found out how easy it was to make soap at home. I love to give it as gifts for the holidays. I have been considering making my own soap for a while now. I will have to give your ‘recipe’ a try! I don’t think that I have made soap since I was in high school. It was a cool project. Although I think this would be something very cool to do with my daughter. And I think the natural and beautiful smells would be awesome. I’ve never thought about making soap before but I have really dry skin and since it’s rich in essential oils, it may be helpful. Thank you for sharing. This is an awesome DIY idea. I didn’t know soap making was so easy and creative. Love the idea of infusing it with essential oils and added moisturising agents. I have always wanted to make my own soap since I make my own candles now. This recipe I am going to have to try. It sounds like it would be great for the skin in my opinion. Thanks for sharing the recipe. 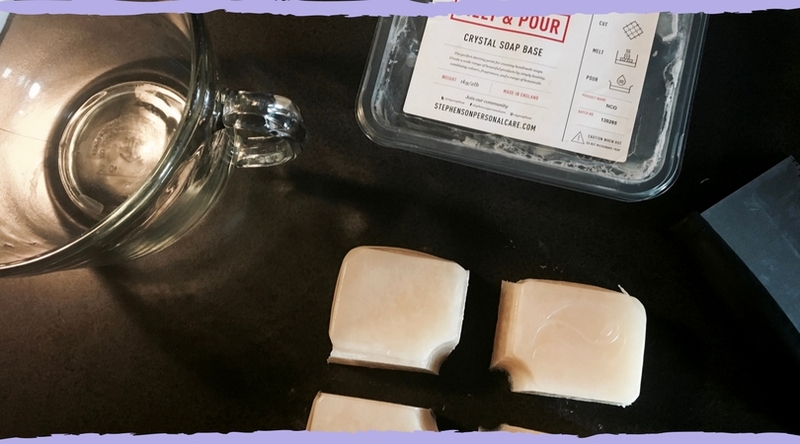 What a fun idea to make your own soap! These would be great for stocking stuffers this year! I have never tried to make my own soap, bu I have purchased some and I love it! I never really knew how to do it myself, so thank you this is super helpful! I just might have to try attempting it now! Thanks for sharing! This is perfect! Can we a humble gifts for this holidays. Do you also sell them? I was thinking about it. Might want some more practice first!